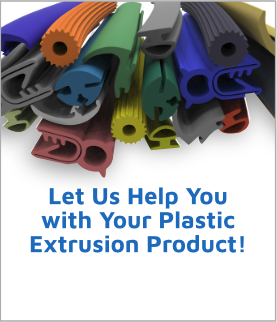 Custom Extrusions | Extruded Plastic | Plastic Profiles | Crafted Plastics Inc. Creating and producing custom plastic extrusions requires unique skills and talents. Crafted Plastics Inc. inquisitive and searching minds bring new approaches to the process of making the specialized extruded plastic product to meet the high standards required by today's customers. PROCESS CAPABILITIES: The process of extruding plastic includes tooling heat and speed. Having worked with many thousands of profiles from 1/8" to 7" and many types of raw materials, our expertise covers an extensive range of uses. For hollow sections and complex plastic profiles, Crafted Plastics Inc.'s downstream sizing techniques produce precise dimensions and tolerances. CO-EXTRUSION: The co-extrusion process is used when two materials and colors must be joined into one part. DUAL DUROMETER: Provides the making of a plastic extrusion where the same family of plastics, but with different hardness, are combined in various combinations-flexible and rigid, flexible and flexible, rigid and rigid. The term also applies when two different opaques are used in combination to make a part. THE TRI-EXTRUSION: This process involves combining three materials or colors when needed in one plastic extrusion. 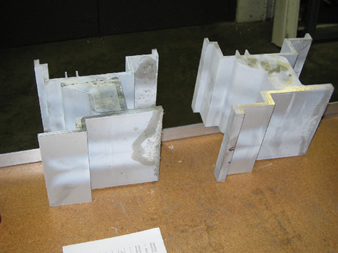 VALUE ADDED OPERATIONS: After a plastic profile is extruded, additional work can be done. This work includes drilling, punching, notching, creating round or oval holes, cutting mitres, and doing precise tolerance cutting. While the profile is being extruded, the following processes can be completed: adding tape (film, foam, or magnetic), printing, or close tolerance cutting. Crafted Plastics Inc. innovative research and development approaches in working with plastic extrusions has resulted in substantial savings for our customers. With attention to detail, Crafted Plastics Inc. can hold the customers required tolerances because of our highly developed Quality Control System.